Rich in marine minerals, including potassium, magnesium, calcium and iron, Kelp is a large, leafy seaweed belonging to the brown algae family that grows in "forests" in the colder waters of the world’s oceans. Kelp has been used for centuries as an important nutritious staple ingredient in Chinese, Japanese, and Korean cuisines. It is also an excellent source of iodine, which has been shown to be essential for healthy thyroid function. Your thyroid gland is responsible for producing the hormones that support normal cellular metabolism. 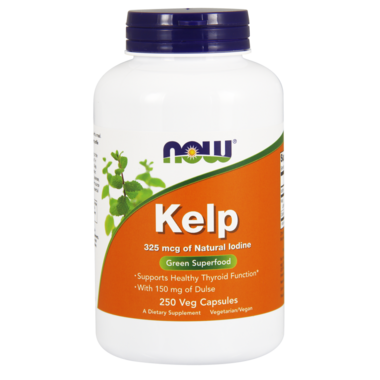 As with most green foods, kelp also contains vitamins and cell salts essential for good nutrition. Suggested Usage: As a dietary supplement, take 1 Vcap daily, preferably with meals. NOW Kelp caps delivers the natural nutrient profile found in Genuine Whole Foods. Other Ingredients: Veg Capsule (Hypromellose, Water), Cellulose, Stearic Acid and Silica. Great way to get your iodine in!! Easy to take !